Podcasts are yet another aspect of my smart device that I often file away into the “yep, not touching that” file. Not because they aren’t quality—in fact, there’s more quality podcasts than ever now. There’s just too many of them out there and it’s tough to sort everything. Years ago there were only a few shows out there that I listened to, but now nearly every aspect of pop culture and entertainment has a podcast. Do you want to listen to a weekly show about The Golden Girls? Google “Out on the Lanai.” Seriously, do it. Enter Castaway, a new app that I’ve been using recently to help organize this madness. The UI is relatively unassuming, as is the entire process of booting it up. Everything is presented within the confines of a normal iTunes interface, from the white backgrounds to the plain old black text. On the main menu you’ll find your personal listings, with the ability to sort and prioritize episodes that haven’t been played yet. It’s unassuming and plain, as the only real options are a toggle for how much time the “forward and backward buttons” will skip (30 seconds is the default), and a button to allow automatic downloads with a further toggle for cellular data downloads. There’s three simple buttons at the bottom of the screen when bringing up a search—top charts, networks, and search. That’s about it. The former option is self-explanatory, but “networks” will generally provide you with stiffer categories that mainstream listeners might enjoy, like “public radio” and “sports.” The search function, I’ve found, is rather unforgiving, and you’ll have to know the exact name of a podcast to really find it. Castaway is only a slight upgrade from the basic interface included in iOS, and your mileage may vary depending on how heavy your podcast intake is. There’s no extra features like the power to skip through dead air automatically, or anything special about it, really, to justify a recommendation over most of its competition—but hey, it works as advertised and is a pretty decent recommendation over the default app. 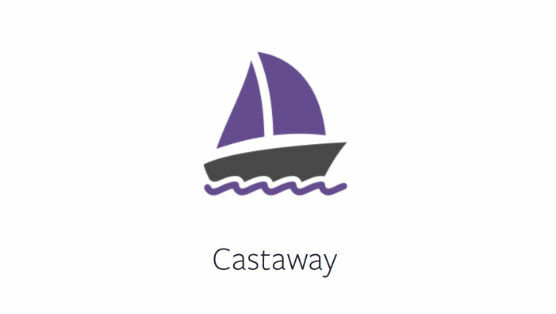 Castaway is an iOS app that can be downloaded for $2.99 in the iTunes App Store.